(CNN) -- Emergency teams on Sunday were assessing damage from deadly storms that devastated parts of Missouri, Kentucky and West Virginia this weekend -- even as the threat of more severe weather continued. West Virginia Gov. 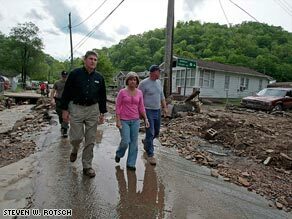 Joe Manchin tours Mingo County to assess damage caused by extensive rain and flooding. The storm that tore through Madison County, Kentucky, on Friday was a category EF-3 tornado, the National Weather Service said Sunday. An EF-3 is the third-strongest category of tornado, with winds of 136 to 165 mph, strong enough to destroy large buildings and lift cars off the ground. At least one person was killed by that storm, with several other serious injuries. A waste water treatment plant was destroyed, two fire departments sustained major roof damage and some manufacturing facilities were damaged, local authorities said. Three people were killed in southern Missouri during high winds, thunderstorms and flash floods. A couple was killed when a tree fell on their car on a highway near Poplar Bluff. A man died of a heart attack near Springfield when winds tossed him and his wife into an open field, officials said. A weekend of storming in West Virginia destroyed as many as 400 buildings and severely damaged an additional 1,000, said Rob Jelacic of the West Virginia Office of Emergency Services. "We are in recovery mode," Jelacic said Sunday. There were no known deaths in West Virginia from the storms. After the storms came floods. On Sunday, parts of the Meramec and Big rivers were rising feet above flood levels, causing residents already hit by the storms to seek higher ground. Forecasters expected the Meramec to crest Monday 4 to 8 feet above flood state in St. Louis County. The big river was expected to crest a half-foot higher on Monday than it did Sunday.